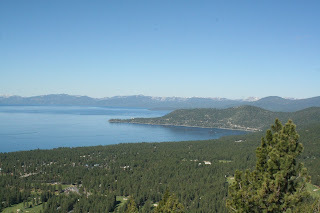 We finally arrived in Tahoe at around 1:00 am, which was 3 am our time. We figured we'd sneak into our vacation rental so as not to wake the rest of the group but to our surprise they greeted us with open arms at the door. The weekend went uphill from there and we made a ton of memories that we'll keep with us forever. It's amazing that 4 couples who have never formally met can stay a weekend in the same house, share two bathrooms with 8 people and still get along beautifully. We had such a crazy fun weekend and haven't laughed so hard in a long time! Why couldn't you take the flight and then just send your baggage on the later flight and have it delivered to the place you were staying? Thanks Chris for sharing about your weekend when I saw you today, and Mari so glad I took the chance and got to say a personal "safe travel and have fun" to you before you leave in the a.m. No doubt about it - it was worth the wait on Thursday to enjoy the time in beautiful scenery and the company of all your quad pals. So glad you got to have this time! Cohen, Finn, Noah, and Sophia - enjoy the trip and send back lots of pictures! i have been keeping up with your blog for a while now, but never commented. i don't think i have anyway. the video was hysterical by the way, you guys are so fun! it is so wonderful that the 4 (and now 8) of you have become so close! I LOVE YOU GUYS SO MUCH! I just smile when I think of you! Can't wait to read more.. the weekend was over WAY too fast! awww! great post mari! 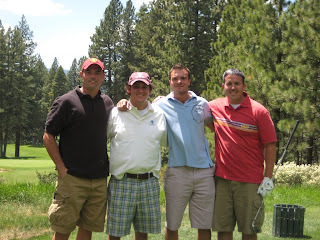 i like that one of us laughing, and our cute little hubbies all decked out for golf! miss you TONS! hope you made your flight this morning!! thinking about you--have SOOOO much fun! Anonymous, we hoped to do the same, but TSA will not allow you to check in luggage more than 4hours in advance of your flight - it was such a bummer. 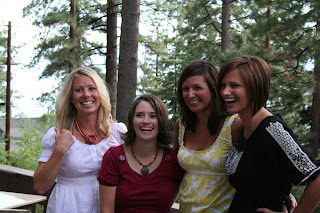 I am so glad you girls (and hubbies) were able to meet. I have enjoyed reading about it! Looks like such a blast!! So glad to hear you had such a great time! How amazing!!!! I am so happy for you and the other girls. I love all your blogs and can imagine how awesome and amazing it was to finally meet. I wish you all the best and hope you can get together more often!! Oh, and AMAZING husbands planning this behind your back..simply AMAZING!